Todd Robert Bowles was born November 18, 1963 in Elizabeth. He grew up playing pickup football games with his friends and two older brothers. Todd played quarterback in these games. Later, for coach Don Somma at Elizabeth High School, he played every other position—including tailback, tight end, corner and safety. Todd was recruited by Temple’s Bruce Arians. By 1984, Todd’s junior year, he was the heart of one of the nation’s best defenses, along with Kevin Ross and Anthony Young. He picked off 7 passes in 41 college games. Todd went undrafted in 1986 but was invited to camp by several NFL teams, including the Washington Redskins. He won a backup job as a defensive back and was part of the team that bombed the Broncos in the Super Bowl. Todd moved into the starting lineup as a free safety the following season. He intercepted 13 passes in six seasons with Washington. Todd signed with the 49ers as a free agent in 1991 and played one season before being released. The Redskins brought him back for two seasons before he called it a career. Todd thought he might be interested in coaching. His defensive backs coach, Emmitt Thomas, advised him to get away from the game for a while—otherwise he would just be coaching the way he played. Todd followed Thomas’s advice and returned to the NFL in 1995 as a scout with the Green Bay Packers. Todd began his climb up the coaching ladder at Morehouse College and then at Grambling, working alongside Doug Williams. He joined the coaching staff of the Miami Dolphins in 1998 and was named interim head coach at the end of the 2011 season, after Tomy Sparano was fired. The Dolphins went 2–1 to close out the season. The following year, Todd found himself as part of Andy Reid’s staff in Philadelphia. Reid named him defensive coordinator midway through the season. In 2013, Bruce Arians hired Todd to be his defensive coordinator with the Arizona Cardinals. Todd revamped the defense and helped the club double its victory total from the previous year, winning 10 games. In 2014, the Cardinals went 11–5 and Todd was voted Assistant Coach of the Year in he first year the award was given. 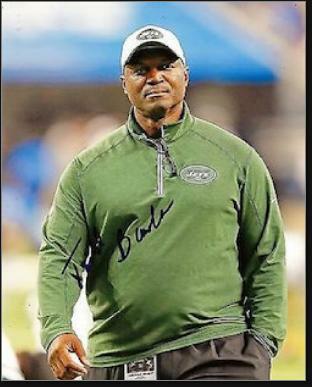 The New York Jets hired Todd to be their head coach in 2015. The team had imploded under Rex Ryan the year before. Under Todd, the defense tightened up and backup quarterback Ryan Fitzpatrick had a career year. The Jets won 10 games and narrowly missed the playoffs. In 2016, the law of averages caught up with New York and the team plummeted to 5–11. Jets fans were calling for Todd’s head, but owner Woody Johnson stuck with him in what was meant to be a rebuilding 2017 campaign. After dropping their first two games, the Jets rallied under low expectations (some experts picked them to win 2 games) and beat the Dolphins, Jaguars and Browns to stand 3–2 after five games. Three losses followed, but the team was in each game until the final minutes. With their co-tenants, the Giants, suffering through a catastrophic season, Jets fans owned unexpected bragging rights to New York football in 2017 albeit with a 5–11 record. The Jets took quarterback Sam Darnold in the first round of the 2018 draft and Todd handed him the reins to the offense. Darnold overcame inexperience and injuries to finish the year well, but the team let too many games slip away, including an epic overtime battle in late December against the Packers. Though highly respected as a coach around the NFL, Todd failed to turn the team around and the defense never developed a big-play personality. The Jets fired Todd after the season and he immediately joined Arians as defensive coordinator with the Tampa Bay Buccaneers.